These are a select group of unusually good values and are most are limited availability. Because some are limited quantities order now if you wish to take advantage of the savings. All are brand new, factory fresh selections shipped quickly to your home. 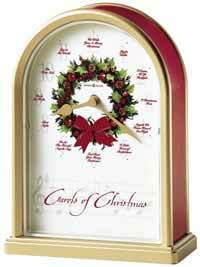 All clocks include FREE PRIORITY SHIPPING AND NO SALES TAX. 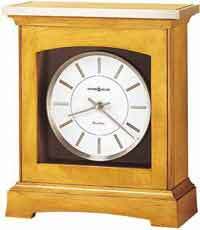 Traditionally styled tambour Cherry chiming mantel clock has a wide and slender profile. Off white dial has Arabic numerals and old style serpentine hands. Hinged front bezel is milled brass with a convex glass lens and is hinged to allow access to the hands. Quartz, triple chime Harmonic movement plays your choice of full Quarter hour Westminster or Ave Maria chimes or Bim Bam chimes with strike on the hour. Westminster chime switch for strike on the hour only. Night-time shutoff switch will silence the clock between 10:00PM - 7:00 AM. Operates on 2 "C" Duracell Batteries. Assembled in Virginia. Three Year Warranty and Free Shipping. 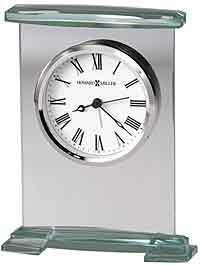 The Howard Miller Angelina 611-266 Grandfather Clock is part of Howard Millers New 91st Anniversary Edition of clocks. This clock is inspired by the Swedish Mora clocks from the late nineteenth century. This clock has an aged look that is achieved through spatter marks, the use of a rasp, and well placed dents. The Antique White finish features brown undertones on select hardwood and veneers. The dial has an aged look with black Arabic numerals that look worn and charcoal grey hands behind a glass crystal that is convex. Two Year Warranty and Free In Home Delivery. 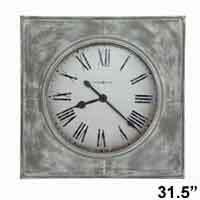 This oversized aged metal wall clock is 31.5" square and is finished in aged white and gray. The aged dial with aged black Roman numerals and aged black spade hour and minute hands sits behind a glass crystal and is surrounded by a formed metal bezel finished in aged white and gray. Quartz, battery-operated movement requires one AA sized battery (not included). One year warranty and Free Shipping. Size: Height 31.5" Width 31.5" Depth 2.75". Polished brass finished handle. Brass finished dial offers a silver chapter ring and decorative corner spandrels. Durable bronze bushings. Finished in Cherry Bordeaux on select hardwoods and veneers. Key wound, Westminster chime movement with chime silence option lever and durable bronze bushings. H. 14-3/4" W. 11" D. 7-1/4"
Howard Miller Mia is finished in Worn Black with red and brown undertones on select hardwoods. This handsome wall clock features fluted columns with raised beveled column caps and flat glass that encases the dial and brushed antique brass-finished pendulum bob with brass-finished harp and lyre. Aged dial with aged black Roman numerals, black serpentine hands, and a brushed antique-brass finished bezel. Requires four AA sized batteries. Quartz, battery-operated, single-chime movement plays Westminster melody on the hour and counts the hour. Automatic nighttime chime shut-off. One year warranty and Free Shipping. The off-white dial offers a convex glass crystal, polished brass finished bezel, black Arabic numerals and brass second hand. Quartz, battery operated movement will play Westminster chime melody on the hour and also count the hour. Finished in Golden Oak on select hardwoods and veneers. Chimes silence with the automatic nighttime chime shut-off feature. Quartz, battery operated movement. One Year warranty and Free Shipping. 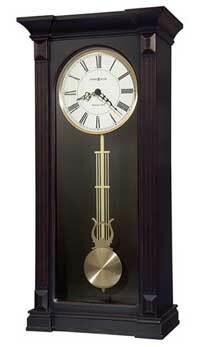 The Howard Miller Torrence 611-268 Grandfather Clock is part of Howard Millers New 91st Anniversary Edition of clocks. This clock is inspired by the Swedish Mora clocks from the late nineteenth century. This clock has an aged look that is achieved through spatter marks, the use of a rasp, and well placed dents. The Antique Grey finish features white undertones on select hardwood and veneers. The dial has an aged look with black Roman numerals that look worn and charcoal grey hands behind a glass crystal that is convex. Two Year Warranty and Free In Home Delivery. Size: Height 81.5", Width 22", Depth 11.25"
The Howard Miller Torrence 625-637 Wall Clock is part of Howard Millers New 91st Anniversary Edition of clocks. This clock has an aged look that is achieved through the use of a rasp, spatter marks, and well placed dents. The Antique Grey finish features white undertones on select hardwood and veneers. The dial has a glass convex crystal covering the black Roman numerals that look worn and charcoal grey hands. One Year Warranty and Free Shipping. Simple lines best describe this case, which offers a flat-top pediment with a nickel finished molding. The white dial features a nickel finished bezel with simple-styled hour markers and hands. Finished in Urban Casual on select hardwoods and veneers. Automatic nighttime chime shut-off between 10:00 pm and 7:15 am. Quartz, dual chime movement plays Westminster or Ave Maria chimes, and features volume control and automatic nighttime chime shut-off option. One Year warranty and Free Shipping. 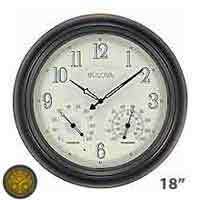 Size: Height 12-1/2" Width 10-3/4" Depth 4-1/2"
Designed after a traditional Jeweler’s Regulator clock. Dentil molding wraps around the pediment and diagonally cut oak overlays appear at the upper corners. The off-white Roman numeral dial offers a solid brass bezel. The front-opening locking glass door showcases the polished brass lyre pendulum and beat plate. Finished in Oak Yorkshire on select hardwoods and veneers. Locking door. Key wound, Westminster chime movement with chime silence option and durable bronze bushings. One year warranty and Free Shipping. 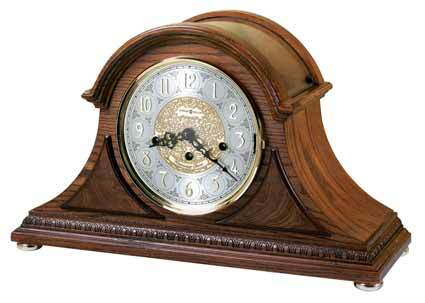 Size: H. 35-1/4" W. 14-3/4" D. 6-3/4"
Traditional look of a tambour style mantel clock, The Rhythm Joyful Remington is set off by the two raised accent panels on the face to enhance the beauty of this model. 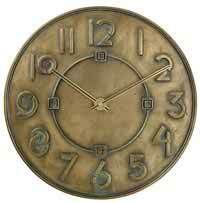 Beaded molding on the base with an antiqued dial and antique brass bezel. Our signature musical movement offers 6 Christian Hymns / 16 Popular Melodies / 6 Christmas melodies. Adjust the volume or you may turn off the sound completely or use automatic night-time shutoff. Runs on 2 C Batteries (Included). One year warranty and Free Shipping. The Joyful Remington plays one of 28 melodies (no chimes) every hour on the hour from 3 different melody groups. Just flip a switch on the side to change your group selection. The Bulova B1511 Thomaston Chiming Mantel Clock in a dark brown cherry finish on a hardwood case with front glass dial. Bracket style design with a brushed metal dial with cast,applied corner spandrals. Roman numeral dial and metal filigree hands. Decorative, scalloped base and sides. Protective glass lens and cast metal "carriage" handle. Bulova Harmonic triple-chime quarter hour movement plays choice of Westminster, Ave Maria or Bim-Bam melody on the hour. One year warranty and Free Shipping. Size: Height:14.25" Width: 10.5" Depth: 6.5"
Anniversary style mantel clock in a solid wood case with an old world walnut finish. Decorative carved frontal accents and silk-screened glass front and side panels. New Harmonic Triple Chime movement will play the Westminster chime, Ave Maria or Bim-Bam chimes on the hour with a full hour count. Volume control, Automatic Night time shutoff selection and rotating pendulum. Anniversary collection from Bulova Clocks. One Year warranty and Free Shipping. Size: Height 11.5" Width 8.25" Depth 5"
Contemporary desk clock with engravable brushed aluminum metal case with a polished silver bezel and cream dial. Contemporary Arabic numerals and hour markers protected by a glass crystal. Brushed silver 2.5" x .5" engraving plate included for personalization. Requires (1) LR43 battery, included. One Year Warranty. 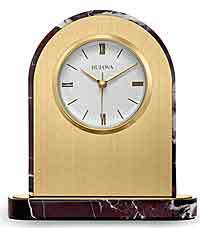 Size: H: 6.5" W: 3" D: 2.25"
The Bulova B5002 Obelisk tabletop clock is made from a solid block of aluminum with a vertically brushed finish. This clock is all about sophisticated fun. The raised iconic Bulova tuning fork is set at the 12 position on the classic ebony dial. The dial is surrounded by a polished silver bezel. This clock comes in a exquisit black presentation box. Included is a brushed silver engraving plate for personalization. (3" x .5"). Requires (1) LR44 battery, which is included. One Year Warranty and Free Shipping. Contemporary tabletop clock with a black frame surrounding a wood veneer center. Weighs 4 pounds and features a glossy black bezel, ebony dial, and crystal lens. Brushed black engraving plate included for personalization. Requires (1) AA battery. One Year Warranty and Free Shipping. 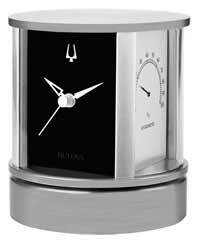 Size: H: 7" W: 5.25" D: 2.5"
Executive desk clock and weather station with aluminum base. Weighs 3 pounds. Thermometer displays room temperature. Includes space for personal photo. Features black dial with iconic Bulova tuning fork with crystal lens and quartz movement.Brushed silver round engraving plate included for personalization. Requires (1) AA battery, not included. One Year Warranty and Free Shipping. Size: H: 4.75" W: 4.25" D: 4.25"
Case is solid imported Turkish Rosso Levanto polished marble with white accent veining. Contemporary dial has Roman numerals and hour markers. Brushed brass-finish removable face plate suitable for engraving. Protective glass lens. Additional engraving plate included (3" x .5", 7.6cm x 1.3cm). Accurate Bulova Quartz movement requires (1) AA battery. One year warranty and Free Shipping. Size: Height 7.5" Width 7" Depth 3.75"
Sphere-shaped metal case, polished rose gold-tone finish. Removable clock rotates freely on base. Grey dial with instrument-gauge-styled numerals, a guilloche pattern used on high-end Swiss watches accents the dial, and a smooth sweep second hand. Requires (1) LR44 battery, included. Engraving plate included (2" x .75"). The Bulova B6213 Image Picture Frame Clock features a metal case with embossed mosaic pattern enhanced by glittering resin. The left panel holds a 4 x 6 photograph in a horizontal position. The right panel is a rectangular contemporary dialed clock with a white face and mirror-finished numerals. Requires one (AA) battery, not included. One year warranty and Free Shipping. Size : H: 7.75", W: 11", D: 1.5"
The Bulova B6215 Windswept III Sailboat Clock is a Graceful desk clock with a sailboat design. The beveled cut and polished mineral glass edges and contrasting blue foresail create a stunning look. The clock insert has a sun ray patterned satin silver bezel surrounding a white face with Arabic numbers and straight black hands. Clear silicone feet protect the hull from any surface. Requires one (LR44) battery, included. One year warranty and Free Shipping. 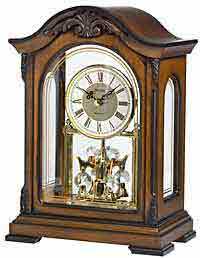 Size : H: 7.5", W: 6", D: 1.75"
Gracefully curved mantel clock with polished brass finished feet finished in a brown cherry stain. With quartz movement, clock includes a diamond-cut brass finished bezel, convex glass lens, and traditional Roman numeral dial with filigree-cut metal hands. Lower case with mirror inset houses the Bluetooth® wireless speaker system. Works with Android and IOS software. Included is a USB cable and universal charger for worldwide use. Mirror polished silver oval engraving plate included for personalization (4" x 2.5") Requires (1) AA battery for clock (not included). Rechargeable speaker batteries included. One Year Warranty and Free Shipping. Size:H: 13" W: 11" D: 5"
The Bulova Empire has an Industry Exclusive Bluetooth®-enabled speaker system. You are able to stream any type of programming from a tablet or smart phone and hear it from the clock wirelessly. It works with Android and IOS software. The Bluetooth® speaker is powered by a set of rechargeable batteries (Included). There is a USB cable and universal charger included for worldwide use. One year warranty and Free Shipping. 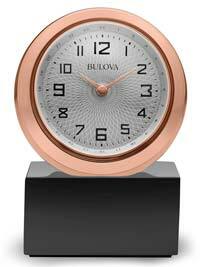 The Bulova B9851 Centura Table Clock offer a heavy octagonal crystal case that is hand-cut and polished. Beveled edges on the top. Silvertone skeleton movement with open gears and a seconds subdial. Brushed aluminum background. 2" x .5" engraving plate included. One battery will power the clock. One year warranty and FREE SHIPPING. This satin brass finished table clock features red marble-tone sides and a decorative wreath at the center of the dial. This original, signed artwork was commissioned by Howard Miller exclusively for the Sounds of the Season Collection. As the hour hand moves from hour to hour, you will hear these carols featured at the hour: The acrylic crystal protects the dial and the gold tone hour and minute hands. Automatic nighttime chime shut-off option. Quartz movement includes the battery. One year warranty and Free Shipping. 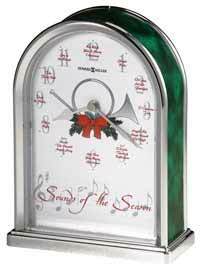 This polished, sliver-finished arch table clock with green marble-tone sides plays a different Christmas melody on the hour. This original, signed artwork was commissioned by Howard Miller exclusively for the Sounds of the Season Collection. As the hour hand moves from hour to hour, you will hear these carols featured at the hour: The acrylic crystal protects the dial and the gold tone hour and minute hands. Automatic nighttime chime shut-off option. Quartz movement includes the battery. One year warranty and Free Shipping. Oversized hardwood case, dark brown cherry finish with distressed wormhole accents. Closed bonnet design with a heavily carved shell pattern at crown and matching scroll columns on front. Metal dial with faux lunar design, and raised numerals and corner spandrels. Lyre pendulum. Bulova Harmonic triple-chime movement plays choice of Westminster, Ave Maria or Bim-Bam melody on the hour. Quarter-hour Westminster chime and strike available. Volume control. Automatic night shut-off switch. included. Requires (1) AA (2) C batteries. One year warranty and Free Shipping. Size: H: 36" W: 16.7" D: 7.75"
The Exhibition Wall Clock is part of the Frank Lloyd Wright Collection®. It has a dimensional cast resin case with an antique bronze metallic finish. It has a raised outer rim and center ring. The stylized numerals are an adaptation of the Exhibition typeface that was developed by Wright in the 1930s for use on a special series of exhibition drawings. One year warranty and Free Shipping. Solid wood and wood veneer case in an Old World Walnut finish. Decorative carved accents along the edges. Decorative screened front glass. Metal vienesse dial in white with Roman numerals. The Harmonic triple-chime plays choice of Westminster, Ave Maria or Bim-Bam melodies on the hour. One year warranty and Free Shipping. Size: H: 19" W: 9" D: 3.75"
Bulova Ashford II C3543 Regulator Chiming Wall Clock with New Harmonic Chimes that are more real than ever. Solid wood and veneer case with walnut finish. 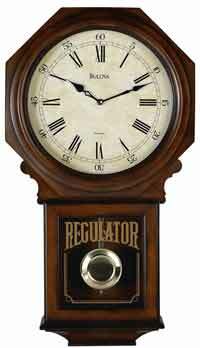 Classic design Schoolhouse, Regulator design with a solid wood octagonal dial frame with a polished brass pendulum. Decorative glass front with silk-screened Regulator in antique gold. The Harmonic triple-chime plays choice of Westminster, Ave Maria or Bim-Bam melodies on the hour. One year warranty and Free Shipping. 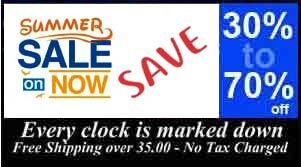 All Howard Miller, Seiko and Bulova Clocks are on sale at the lowest prices allowed by the manufacturers and Free Shipping on 99% of all selections SITEWIDE! Your selection will be delivered quickly!